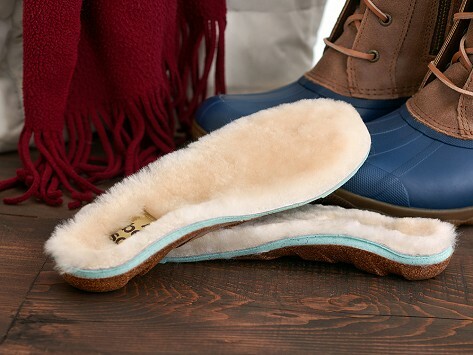 Sheepskin insoles are a warm and comfortable step forward for those who love going sock-free, even in the colder months. Soft sheepskin is layered over antibacterial and antifungal cork that helps wick away moisture to control odor and increase breathability. The contoured insoles feel good against feet and are cushioned by a layer of shock-absorbing recycled rubber foam. Added arch support and heel stability help make every step feel good. Dimensions: 12" x 4" x 1"
My Honey Soles Sheepskin Insoles are soft, warm and supportive! My Honey Soles Sheepskin Insoles are soft, warm and supportive to my not so supportive Boots. I’m very happy with them and highly recommend. Honey Soles Maker and avid boat-shoe wearer Brad Sunness loved the feeling of going sockless, but not the side effects. Achy feet and not-so-fresh shoes lead him to try many types of insoles and other solutions, but nothing gave him the foot-friendly results he was looking for. After researching different materials and prototyping several designs, Brad honed in on cork for its natural antibacterial and antifungal properties. He paired the moisture-wicking material with a layer of recycled rubber foam for better shock absorption and he gave the insoles a contoured design that offers arch support and increased heel stability. Brad got great feedback from folks who felt like the insoles were custom made for their feet. Requests for a cold weather version soon followed. He created Bear Soles that have all the benefits of Honey Soles with an added layer of plush Australian sheepskin. Either way you go, Brad’s insoles will help keep feet happy with every step.